Could You Play Mortal Kombat Without The Gore? We ask the hard hitting questions here at Cultured Vultures. Game Informer recently interviewed Ed Boon, co-creator of Mortal Kombat, and asked him what he thought was the biggest misconception about the franchise. His reply was the idea that people wouldn’t play the game at all if it didn’t have any of the violence that the series has become known for. In the interview itself, Boon talks about how people wouldn’t buy more and more of a game every single time it came out just to see those fatalities, and how the misconception was originally formed in the mid-90s, but it started me thinking. Could Mortal Kombat exist if the gore was completely removed? Would people even want to play that version of the game? The gore and violence depicted in Mortal Kombat, specifically in Mortal Kombat 11 which features some of the craziest, bloodiest and inventive fatalities yet, has become so intrinsic to the series that it’s hard to imagine a version of the game without it. Just try to imagine a version of the game with no blood, dismemberment, decapitation and some otherworldly monster with blade arms eating your brain (hi, Baraka). While it’s hard to visualise now, it would have been harder to picture a game like that earlier on in the series’ history. The first three games in the series used the violence of the fatalities to carve out a niche for themselves in an arcade and home console scene dominated by Street Fighter. Without the gore, Mortal Kombat wouldn’t be the fighting game juggernaut it is today. To be honest, we’ve seen what Mortal Kombat would be like without the gore, and it’s called Mortal Kombat vs DC Universe. While not a terrible game, it’s not great either, coming from the era where the franchise experimented with 3D combat. MK vs DC is arguably the most refined iteration of Mortal Kombat’s 3D era, but the core gameplay was still plagued with inconsistencies. It felt like Tekken or Soul Calibur but as if every fight took place in a giant vat of custard. Since Mortal Kombat 9 and the switch back to 2D fighting, NetherRealm Studios put a more enhanced focus on the actual gameplay, and it paid off. Not only did Mortal Kombat 9 contain all the usual blood, guts and viscera that you’d expect, but the gameplay was the tightest and most enjoyable the franchise had ever been. With NetherRealm Studios growing as a game developer, creating the Injustice series alongside Mortal Kombat, the team have been able to learn, adapt and evolve the MK series, adding in new elements such as interactables from Injustice to improve MK. Meanwhile, features like Crushing Blows and Fatal Blows prove that the series isn’t afraid of change. From MK 9 onwards, it’s felt like the series, and the developers as a whole, have gone beyond making “that fighting game where you rip each other’s heads off”. Sure, it’s still a core part of the game’s identity, but there’s enough substance between the decapitations to ensure that Mortal Kombat isn’t just a one trick pony. Unfortunately, there’s a new conversation that’s emerged surrounding Mortal Kombat and its use of gore, and how it affects the realm of content creation. 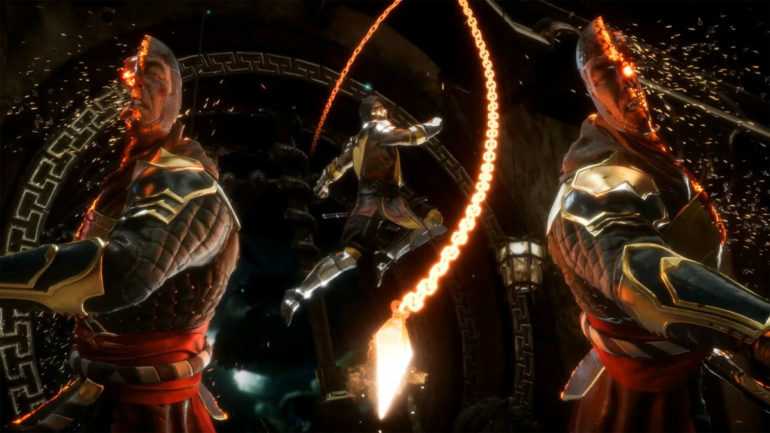 Various content creators who have made videos on Mortal Kombat 11 and published them on YouTube have found their videos to be demonetised and age-restricted, rendering them unavailable in certain countries. Fighting game YouTuber and Twitch streamer Maximilian Dood has perhaps been most vocal about this issue, as he’s experimented with different filters and video editing techniques to try and mask the gore that’s prevalent throughout the video. Through his investigation, it seems that YouTube deems Mortal Kombat 11’s gore to be “real violence”, and is demonetising all videos as a result. This raises a dilemma for NetherRealm’s ambitions for Mortal Kombat 11 to be a viable eSports title, with big events like EVO hosting MK 11 on the main stage. Meanwhile, tournament organisers Beyond The Summit are hosting a Summit of Time event dedicated solely to Mortal Kombat 11. The issue is that if YouTube and perhaps other platforms are taking a draconian stance against the gore in Mortal Kombat, whether intentionally or through just a fault in the algorithm, content creators will be dissuaded from making MK11 content as they won’t earn any money from it, unless they decide to frame-by-frame edit around the bloody moments, which is just more work for less reward. On the flipside, tournament organisers might struggle to find sponsors for their MK competitions, or could find that their streams or video uploads are being demonetising, age gated and blocked in certain countries. This could have a knock-on effect of reducing interest in the game, diminishing prize pots and essentially just killing the eSports scene before it gets a chance to live, forcing the scene to avoid those more adult aspects to actually survive. It’s definitely a misconception that people wouldn’t want to play Mortal Kombat if it didn’t have the violence, especially now that the series offers so much more than just creative dismemberment. That said, content creators and professional gamers might find themselves without a choice in the matter.